A completely renovated 4 bedroom/2.5 bath home located in Creve Coeur, a safe and friendly area. This house is a great location for relaxing stay with your family. The house is fully furnished and stocked with everything you need for a great stay. We’re travel addicts, so we do understand how a comfort and cozy place is necessary for travelling. We’re happy to provide you all tips and recommendations to enjoy fully adventure travel in St. Louis. - 2 minutes away from AMC 12 movie theater, restaurants, gym, Schnucks market, parks. - 20 minutes away from The Arch, Botanical Garden, Central West End, Museums and Stations. Warm Greetings from the travel addicted couple. We've lived in Missouri since 2012, we love our nice and friendly area. We're busy full-time employees, hard-working part-time students, and enthusiastic 24/7 small business owners. In spire of the very full and tight schedule, we do make sure to add up to 3-4 vacations yearly. We've been together in many wonderful places around the world, and do understand how important a convenient and cozy place contributes to an adventure. So we're glad to share our impressive place with all travel lovers and hope you all enjoy your stay. Love, Jess and Mike. Spacious but sparse...good for families. This home is perfect for a big group. We were two couples with 7 children between us and there was plenty of room to stretch out. 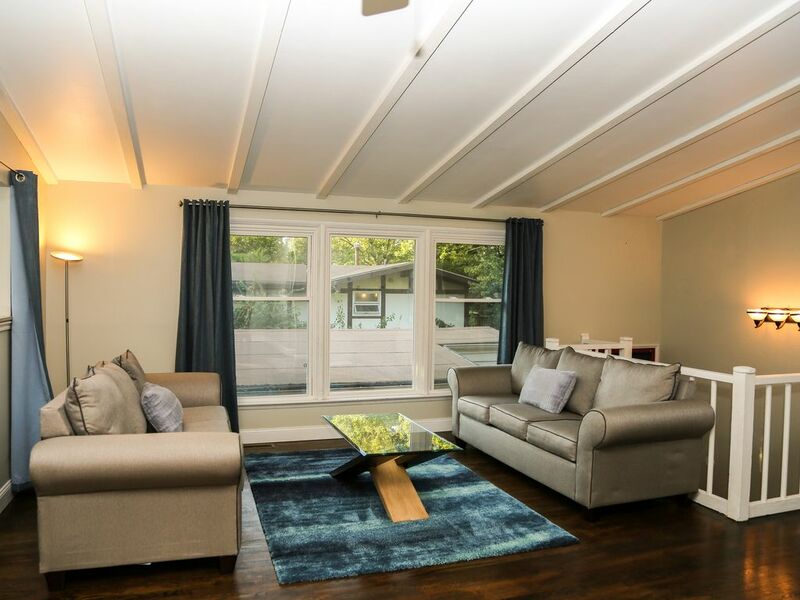 What isn't stated, very clearly, in the listing is that there is a dining room space that connects with the living room and that there is a Keurig coffee maker. One issue we did have is with the banister and stairs. The banister rails are wide enough for an adult head to fit through so we had to keep the little kiddos away. Also, at some point, one of the stair rails and post was removed from the stairs to the lower level. We didn't have any falls but it is not even a little bit safe. For most people, this will not be a problem. For people with young children or people who are much older, and with problems with balance, this is a big problem. Other than the issue with the stairs, we really enjoyed our stay. It is a lovely home, in a lovely neighborhood.